Announced ten years ago this month, the Samsung X830 and P310 are two devices that clearly demonstrate the wide range of physical designs that were seen in mobile phones of that era. Compared to modern smartphones which are very difficult to tell apart, these interesting devices are extremely distinctive. Out of the pair, the most radical looking was the Samsung X830 Blush. A rare "lipstick" style phone apparently in the style of the Nokia 7380, the Blush was actually a rotator as well with a very narrow numeric keypad hidden underneath. With its small screen and prominent circular control pad, this device looked much more like a music player than a phone. The 1GB of internal storage and USB 2.0 support for transferring large files plus the ability to playback most popular music formats, the X830 actually delivered on those promises too. We noted at the time that the X830 Blush looked rather iPod-like and suggested that the forthcoming "iPhone" from Apple might have some similar characteristics. Of course, the iPhone was nothing like this and the the launch of that device a few months later really killed off development of interesting handsets like this. Available in a wide variety of colours, the X830 in pink became the quintessential "girlie phone" of the era, and indeed prices of "new old stock" and second hand units are buoyant, with prices ranging from about €200 for unused versions to €50 or €60 for used ones in good condition. 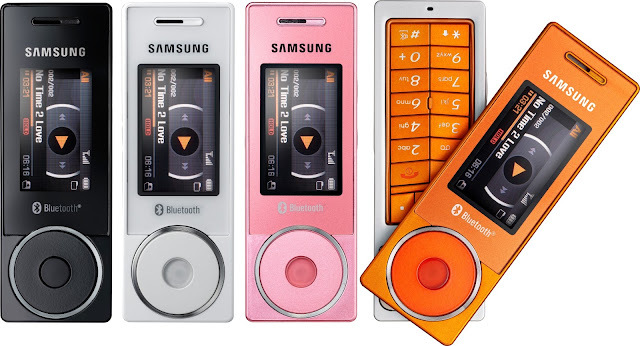 It's certainly good enough to be a usable basic music player even today, with the added ability to make phone calls. Launched at the same time as the X830 was the Samsung P310 Cardphone II. The replacement for the P300 launched the previous year, the P310 kept to same form factor but ditched the "love it or hate it" calculator-style keyboard. Like its predecessor, the P310 was a credit card sized handset measuring just 86 x 54 x 8.9mm, or alternatively it can be seen as being about a third of the size of an Apple iPhone 6 Plus. An uncomplicated device, it did have a great deal of consumer appeal at a time when smaller phones were considered to be better. It did manage to pack a quite high resolution 1.9" QVGA display and come with a 2 megapixel camera, which was significantly better than you might expect from a small phone. Not quite as collectable as the Blush, the Cardphone II still has its admirers with prices ranging from around €40 to €150 or so. Both these handsets belong to an era that was coming to a close in 2006, although at the time nobody knew it. The next four months would see new devices that would change the market forever.